...Belle, Aladdin and Pocahontas nearly ended up living with their mothers? ...more than 100 songs have been composed for and then cut from Disney animated features, including 20 alone from Mary Poppins and 30 from Alice in Wonderland? ...there are little silhouettes of Mickey Mouse hidden all throughout the amusement parks? 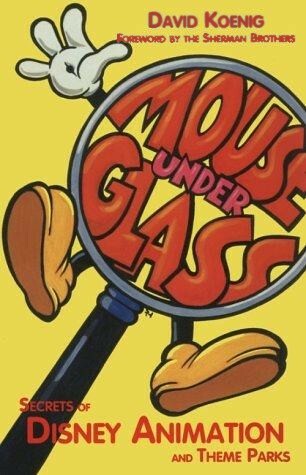 In Mouse Under Glass: Secrets of Disney Animation and Theme Parks, David Koenig takes an unauthorized look at the unknown and the unusual, from animated classics Snow White and the Seven Dwarfs to The Hunchback of Notre Dame, plus theme parks Disneyland and Disney World. Author of the best-selling Mouse Tales: A Behind-the-Ears Look at Disneyland, Koenig reveals hundreds of characters, songs, storylines and theme park attractions that almost were. GMD mention: Pages 108, 175-178 (Chapter 22), 185, 202. The chapter covers the following topics: The Original Tale (Basil of Baker Street by Eve Titus), The Disney Version, Cutting Room Floor (early, scrapped ideas), Plot Holes, Bloopers, and Hidden Stuff. Where can it be purchased: The book can be found online in hardcover or softcover at Amazon.com.